Canadian waterweed (Elodea canadensis) is an invasive plant. Elodea canadensis (American or Canadian Waterweed or Pondweed) is a perennial aquatic plant, or submergent macrophyte, native to most of North America. 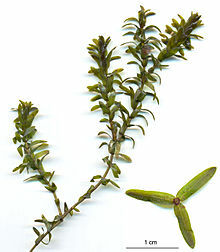 It is an invasive species in Europe, Asia, Africa, and Australia, spreading in ponds, ditches and streams, which are often choked with its rank growth.